What is Saudi Arabia’s End Game for a 123 Agreement? There has been a lot in the media lately about Saudi Arabia wanting a modified 123 Agreement to allow uranium enrichment. Do they need it for commercial purposes or is this about Middle East politics? In a long conversation this week with a senior Wall Street industry analyst who covers utility and energy stocks, I raised the issue of whether Saudi Arabia had an economic need for enrichment for its new nuclear energy program? First of all, why would you build your own fuel cycle production facilities when you can buy nuclear fuel for commercial reactors at bargain prices on the global market? 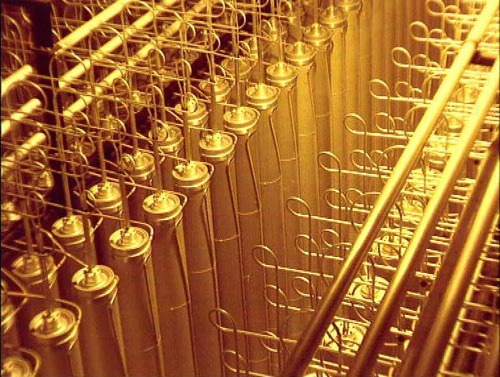 The price of yellowcake is at a record low and there are no near-or-mid-term prospects for it to to up. Ux reports the price is $21.75 lb for U3O8 If you want to know how bad the uranium mining business is, take a look at Cameco’s earnings. “We have seen reduction in global demand expectations, driven by early reactor retirements, delays in reactor construction programs, slower-than-expected restart process in Japan, and by changes to government administrations,” CEO Tom Gitzel said. In words of one syllable, demand for nuclear fuel remains flat due to Japan not yet restarting many of its reactors and U.S. fleet having closed reactors in California, Nebraska, Wisconsin, and Vermont with more to come. In the next three-to-five years we will lose Diablo Canyon, Pilgrim, Palisades, and Oyster Creek. We could also lose Davis-Besse and Perry. That trend going to reduce demand for uranium and nuclear fuel and keep pressure on the price of yellowcake. The U.S enrichment plant proposed by Areva for Idaho was expected to cost over $2 billion and was slated to produce 2 million SWU (units of production) per year. Areva never broke ground because of the low price of nuclear fuel and this was despite having a loan guarantee from the U.S. Department of Energy for a substantial portion of the costs. So assuming KSA builds just two 1400 MW PWR type reactors, which is the current RFP, it makes no business sense to build enrichment capacity. Even if they build four reactors the same logic holds. It’s a lot cheaper for KSA to just buy the fuel by shipping its uranium off to be processed by Urenco, Areva, etc, and have it turned into fuel assemblies or buy from existing production and not bother mining domestically at all. As a practical matter, it would take at least 10-12 1000 MW units with 60 year operating lives to make sense for KSA to even seriously consider making its own nuclear fuel which also includes all the facilities to make PWR type fuel elements. The cost of the entire fuel cycle infrastructure is a lot more than just a bunch of centrifuges. A global supply chain has to be enabled to obtain all the components needed to build and operate these facilities. My point with this list is that it is not just enrichment that’s involved if you are going to get in the business of having your own nuclear fuel cycle. These are enormously expensive investments which are only justified by having a big enough nuclear fleet, or market, to provide a positive ROI. It follow that a claim by KSA about wanting its own enrichment is not related to commercial needs and most likely involves wanting to project the appearance or even a credible threat of eventually starting a nuclear weapons program to counter Iran. So what is KSA’s end game in pushing for enrichment as part of a 1-2-3 agreement with the U.S? It’s to send a the message to Iran from KSA that looks like is this – back off the ballistic missile program or we’ll get enrichment and maybe a bomb. Note that Iran backed rebels in Yemen recently lobbed a several Iranian supplied ballistic missiles into KSA barely missing the airport in Riyadh. That’s almost 700 miles. Saudi reactors would also be targets for Iran’s aggression either directly or through surrogates. The whole thing about the KSA approach to a 123 agreement looks a effort by the Saudi to send Iran a message about its security guarantees from the US. See what we think we can get our friends in the U.S. to do for us, If we succeed you’re behind the eight ball. Keep in mind that President Trump has repeatedly called for tearing up the Iran nuclear deal which has U.S. nuclear trade groups that want to sell reactors to KSA tearing their hair out. If the Saudi government takes an extreme position on enrichment, there will be no 123 agreement and no reactor deals at least for US firms. As far as Westinghouse getting any of the reactor business, which is the media narrative in DC, that’s unlikely since South Korea’s success, and experienced Arab speaking workforce, in the UAE building four reactors there positions it as a front runner. Plus, South Korea has had a $1 billion nuclear contract for an SMR with KSA since 2015. (more on this below). Is the U.S. planning on going along with KSA to put pressure on Iran? It seems like everyone involved is playing with fire. More diplomacy and less posturing with nuclear technology might be a good idea. There is a lot of media reports about Saudi Arabia wanting to build nuclear reactors and whether Westinghouse will get any of the business. Here are five easy pieces that explain why the current mass media narrative misses a few crucial facts. 1. No one can build that many reactors in that short a period of time. This blog post explains why KSA cannot build 16 1000 MW nuclear reactors by 2032. No vendor nor state owned nuclear export firm can do it. Also, price of oil too low. KSA can’t afford $80B. 2. So far plans are to build just two units. This blog post explains that KSA has downsized its nuclear ambitions to just two 1400 MW reactors which coincidentally matches the power rating for the UAE reactors being built by South Korea. KSA has since modified the RFI to open up the competition. However, my view is this is for industrial intelligence purposes and not because a lot of other folks, including Westinghouse, have a shot. 3. The price of oil controls the size of the nuclear program. This blog post explains that KSA first announced its nuclear program in 2011, but did nothing with it until September 2014 at which time it revealed the 16 reactor plan. At that time the price of oil was about $100 bbl. In January 2015 two things happened. First, the price of oil dropped to below $60 bbl and, second, KSA stopped its 16 reactors project cold. 4. South Korea is a likely front runner for any business. This blog post explains why Westinghouse is unlikely to win business supplying nuclear reactors to Saudi Arabia even if the Trump administration relaxes the terms of a 123 Agreement. The reasons are that South Korea has the pole position due to several factors including; success with building four 1400 MW reactors for the UAE, an experienced workforce with a management team that speaks Arabic, and the fact that the 1400 MW design has already been built and operated in South Korea. Also, the Kingdom of Saudi Arabia (KSA) has signed an $1 billion agreement with South Korea to build a 300 MWt PWR reactor. The SMART reactor has a design that uses integral steam generators and advanced safety features. The reactor will have a 60 year design life and a three-year refueling cycle It will be used to generate electricity and to power reverse osmosis desalinization plants at coastal sites. The reactor will generate 100 MW of electrical power for these applications. Bottom line South Korea is already doing nuclear business with KSA. 5. The Russian deal presented by former National Security Adviser Michael Flynn was a non-starter. He attempted to ink a deal between Saudi Arabia and Russia for nuclear reactors linked to the lifting of U.S. sanctions under the Majnitsky Act. The mainstream media continues to describe Flynn’s involvement in the Saudi nuclear deal as driven by greed. It isn’t clear that this was his sole motivation. What does appear to be true is that most of his wires for this project were crossed and shorted out before his plane ever took off from the U.S. to the Mideast in April 2015. 4 Responses to What is Saudi Arabia’s End Game for a 123 Agreement?